Open the Domain tool from the Main Menu; you can also grant permissions with the Users tool (see below). Select Permissions in the tabs bar and click Grant (plus sign) button in the toolbar. Enter the user's name in the User field. Buzz automatically searches the current domain; to search all domains and/or browse through the users you have access to, click the list (browse) icon at the far right of the User field. 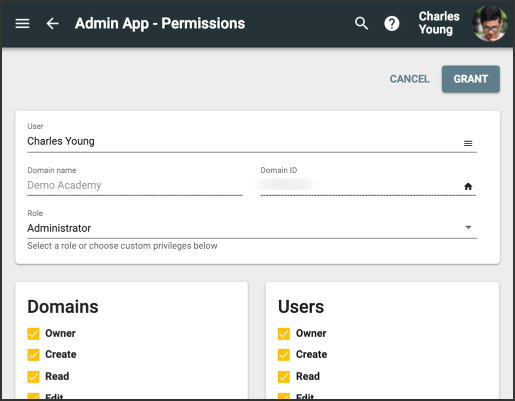 Open the Role dropdown if you want to grant permissions by role; when you select a role, the associated permission checkboxes are automatically selected. If you want to create a custom role, check the boxes next to the permissions that you want included. Permissions are divided according to the component for which they grant privilege. Select the User ID for the desired user. Open the Domain Permissions screen and click Grant [plus sign] button in the toolbar. You can also use this screen to manage and import permissions. To remove permissions, check the user's box on the Permissions screen and click Revoke in the vertical menu in the toolbar; to revoke multiple users' permissions at once, check all desired boxes before clicking Revoke. To import permissions using a tab-delimited or comma-separated file, open the vertical menu in the toolbar, click Import, and browse to the file on your computer. How do I manage a course's enrollments?